Crowned African champion in Port Louis, Mauritius on Sunday 9th September and the winner earlier in the year of the continent’s Top 16 Cup in Nairobi, Kenya; the next quest for Egypt’s Dina Meshref is the Uncle Pop 2018 ITTF Women’s World Cup. Play commences in the three day tournament in the Chinese city of Chengdu on Friday 28th September. 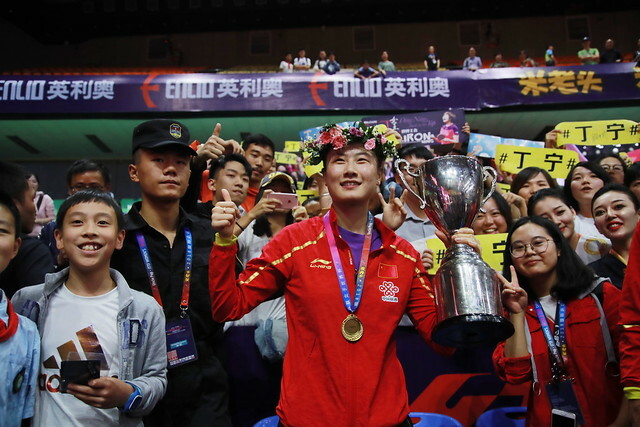 Notably, it will be the 24 year old’s sixth appearance in the tournament, an event in which by reaching the main stage of proceedings in each of the past three years, she has set new standards for Africa. Dina Meshref gave her views on the forthcoming event. “I have checked the list of players and I think that this year the competition is tougher than before; this time, even though my ranking has improved to number 43, I am still going to be seeded 17th among 20 players. I hope I can pass the group stage and make it to the main draw again this year. I also hope that if I reach the main draw, somehow I get a good draw and make it to the quarter-finals. It hasn’t been so easy to recover quickly after the African Championships but I am trying my best to get back in shape after resting. Of course winning an important title such as the African Championships has boosted my confidence and has increased my experience a bit, especially because I was playing under pressure at the African Championship. There were many tough matches. I really hope I can make it to the main draw this year. After qualifying for the World Cup in March my aim has been to reach the quarter-finals this year, I now find it will not be easy. I will be seeded third in my group, only two qualify for the main draw. So it will of course depend a lot on the draw. I hope I can make it to the main draw as I have done in the last three years. Also, I have to say that a very big event such as the World Cup requires more time to prepare: a month maybe, in order to be in the best possible form; however, after recovering from the African Championships, I have only ten days to prepare. Nevertheless, I will fight and do my best to make it to the main draw. Participating in the World Cup means a lot to me, particularly to play in such a prestigious event. I am really very happy that I qualified again this year and I hope I can enjoy it to the maximum. I hope that next year I will be ready to make it to the top four in the World Cup. I will put that as a target and work for it. I guess that the best way to improve our level is to practise in China.